(CNN) -- Initially known as Campos Meta 1 and then Hispania Racing, the HRT team are still seeking stability after a less than spectacular entrance into Formula One in 2010. The Spanish marque, which used seven drivers in 37 races, have already suffered a disrupted preseason for 2012, initially failing an official crash test. The failure meant the Madrid-based team missed the three official preseason testing events, forcing their two drivers to squeeze in valuable time behind the wheel of the F112 during a filming day. HRT's best performance in F1 was Italian Vitantonio Liuzzi's 13th-place finish at the rain-hit 2011 Canadian Grand Prix, where only 18 drivers ended the race. 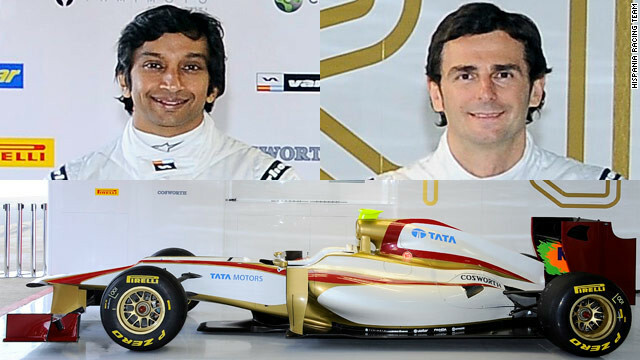 Karthikeyan made history by becoming India's first F1 driver when he took to the track for Jordan at the 2004 Australian Grand Prix. The 35-year-old was also the only Indian on the track when his country made its grand prix debut in New Delhi last year. He lost his seat to young Australian Daniel Ricciardo for the last 11 races of 2011, but has still retained his seat. Karthikeyan has had a varied career in motorsport, which has included the Le Mans 24 hours race in 2009 and a stint in the NASCAR truck series. The veteran Spaniard has been involved in F1 since 1999, when he made his debut with Arrows, and he spent several years at McLaren after a stint with Jordan. The 41-year-old raced just once last season, when he replaced Sauber's Sergio Perez in Canada after the Mexican had been involved in a heavy crash at the Monaco Grand Prix. In 2006, De la Rosa grabbed the only podium finish of his 86-race career with second for McLaren at the Hungarian Grand Prix.